The heat press machine EL 900 is an industrial model that has been developed to obtain a higher productivity in sublimation transfer application. The EL 900 model is an excellent option for those who are looking for a high productive performance and great cost-benefit. The useful area 700 x 1100mm (27,5 x 43,3”) results in an excellent use of the pieces and more productivity considering the optimization of the useful area. 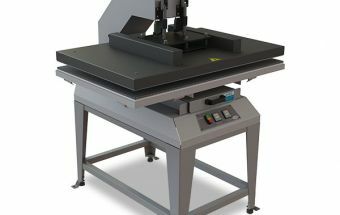 The bottom plate has front open system (drawer system), resulting in an easy operation equipment and ergonomic. EL 900 machine has aluminum-fused resistance and two digital time and temperature controllers, ensuring the uniformity of the temperature on the heat plate, getting as a result one excellent sublimation transfer application.